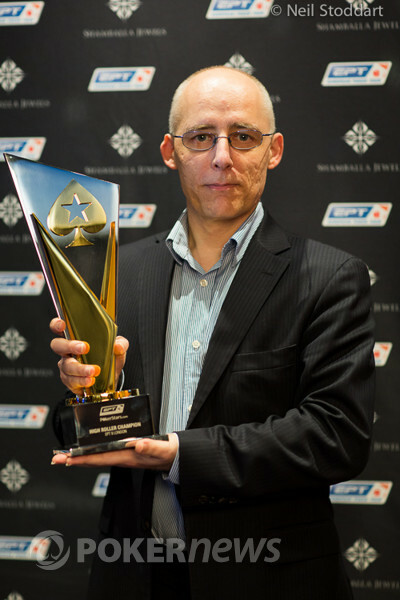 Talal Shakerchi Wins the EPT London High Roller (£436,330)! Talal Shakerchi may not have been the biggest name at the 2013 PokerStars.com European Poker Tour London High Roller final table, but after six hours of play, the British player picked up the title as well £436,330 for his first-place finish. He started the day as the chip leader and is no stranger to these sort of events. 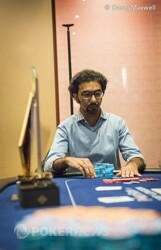 Shakerchi previously won the €10,000 turbo six-max at the EPT Grand Final in Season 8, as well as also appearing at the final table of the €50,000 Super High Roller in Barcelona earlier this season. With this result, he now has over a $1 million in lifetime tournament earnings. 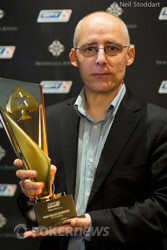 Short-stack Dimitar Danchev was the first player to be eliminated. The Bulgarian who won the PokerStars Caribbean Adventure a couple of months back lost a coin flip to Faraz Jaka on his final hand and took home £29,540 for his finish. Meanwhile, Team PokerStars Pro Vicky Coren also began the day with a short stack, but fared a bit better than Danchev. She was able to double up when her ace-rag held against Gautam Sabharwal's king-jack for a 400,000-chip pot. The first major dramatic moment was the one-two punch just before the break that saw Fabian Quoss double up through Shakerchi, and then Sabharwal eliminate Frenchman Eric Sfez. Shakerchi made a move against Quoss, hoping the German didn't have the goods, but quickly found out that he did. Then, just as everyone went on break, Sabharwal's aces held against Sfez' flush draw to knock him out in eighth place, and the remaining players were fairly surprised to come back from their break numbering only seven instead of eight. JC Alvarado was knocked out in seventh when he got incredibly unlucky against Quoss in an 800,000-chip pot. Paul Volpe almost followed him soon after, but, in a blind-on-blind battle against Sabharwal, his king-eight held off the challenge of the Indian's jack-ten. By this time, Coren had gotten short again, and she finally succumbed when her small pocket pair of fives couldn't beat the ace-jack of Quoss, with the latter flopping two aces for good measure. Sabharwal had been chip leader at various points of the day, but he was eliminated in fifth place for £87,270 when he turned top pair and a gut-shot straight draw, only to find Jaka had flopped a straight. This left Quoss, Shakerchi, Jaka and Volpe — the latter of whom has been on a real hot streak as of late. Volpe lost a crucial flip to Quoss to leave him as the short stack, and the bad luck would continue when Volpe found an ace, only for Shakerchi pick up a dominating hand. 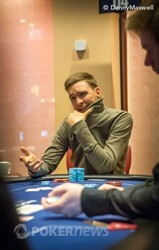 With his fourth-place finish worth £107,410, Volpe's 2013 live tournament earnings now top $1.27 million. Quoss himself would be out of the door next. He flopped two pair against Shakerchi's gutshot and flush draw, and the straight hit. The German couldn't make a boat to survive and fell in third place for £147,690. Like Volpe, Quoss is having quite the year. With this result, Quoss pushed his 2013 earnings up over $1.08 million. This left Shakerchi with over a 4:1 chip lead in heads-up play against Jaka, and it didn't take long for a cooler hand to leave the British player victorious. With the blinds at 25,000/50,000/5,000, Jaka opened to 110,000 on the button. Shakerchi three-bet to 255,000, Jaka four-bet to 510,000, and Shakerchi moved all in. Jaka quickly called with the , but Shakerchi's had him dominated. After the board ran out , Jaka was eliminated in second place to give the title to Shakerchi. Talal Shakerchi opened to 125,000 on the button, Faraz Jaka called in the big blind, and the flop fell . Jaka checked, Shakerchi continued for 150,000, and Jaka called. The turn was the , both players checked, and the completed the board. Jaka led out for 125,000, and Shakerchi called. Jaka showed for fives and deuces, but it was no good against Shakerchi's for eights and deuces. A few hands later, Jaka opened to 110,000 on the button. Shakerchi three-bet to 255,000, Jaka four-bet to 510,000, and Shakerchi moved all in. Jaka quickly called. The queens held as the board ran out , and Jaka was eliminated in second place. The two shook hands, and received a rousing round of applause from the rail. Talal Shakerchi called a 110,000-chip raise from Faraz Jaka, and the dealer fanned . Shakerchi checked, Jaka fired 80,000, and Shakerchi check-raised to 175,000. Jaka folded, and Shakerchi raked in the pot. Fabian Quoss opened to 100,000 on the button, Talal Shakerchi (small blind) called, and so too did Faraz Jaka (big blind). The dealer fanned , both blinds checked, and Quoss continued for 155,000. Shakerchi tanked for 30 seconds or so, then asked Jaka how much he had in front of him. Jaka lifted his hand, then said that he had around 1.2 million. Jaka instantly folded, and Quoss lifted his cards off of the table, gave them one last look, and called. "Just an ace," Quoss asked the dealer. The turn was not an ace, rather it was the , which gave Shakerchi Broadway. Quoss could still double with an ace or a nine, but the bricked on the river. Quoss was eliminated in third place, and we are now heads up. Talal Shakerchi had raised to 110,000 preflop and Fabian Quoss made the call in the big blind. The flop came and Quoss check-called a bet of 135,000 before both players checked the turn. Quoss checked the river as well and Shakerchi bet 235,000 now but the German made a check-raise to 620,000. It didn't take long for Shakerchi to call and Quoss was forced to show , his bluff not working against Shakerchi who had rivered a straight with . Talal Shakerchi opened to 100,000 on the button, Fabian Quoss three-bet jammed for 860,000 from the big blind, and Shakerchi tank-called. Quoss held as the board rolled out , doubling to 1.75 million chips. Shakerchi is still leading with 3.7 million or so. Talal Shakerchi opened to 135,000 from the small blind, and Faraz Jaka flicked forward 110,000 from the big blind. The dealer was about to pull in the bets, and then Shakerchi pointed out that Jaka was short. Jaka quickly grabbed an extra orange T25,000 chip, and tossed it forward. The flop came , and Shakerchi led out for 175,000. Jaka quickly called. The turn was the , both players checked, and the completed the board. The two checked again. Shakerchi showed the , prompting Jaka to muck his hand, and then the dealer revealed Shakerchi's second card; the . Fabian Quoss raised to 100,000 on the button and Faraz Jaka defended in the big blind. Both players checked the flop and the turn. Jaka led out for 220,000 on the river and Quoss called but mucked when Jaka showed . Talal Shakerchi raised to 100,000 from the button, Faraz Jaka and Fabian Quoss both called in the blinds to see a flop. It was checked to Shakerchi who bet 165,000, Jaka called and Quoss folded. The came on the turn and both players checked before Jaka led out for 150,000 on the river, Shakerchi instantly called. It's looking hard to to stop this man at the moment.